Jetiquette® is a global campaign to elevate the travel experience for everyone. As travelers are showing more consideration and courtesy towards each other; airlines, airports, hotels and other travel providers are working to build lasting connections with their guests. The Jetiquette campaign spotlights the most successful customer experience achievements while partnering with travel providers to identify additional opportunities and build awareness. Jetiquette was founded by Gailen David as a grassroots effort to improve the travel experience. In addition to speaking to groups on the topic of travel manners, he created training programs for American Airlines, Air Transat Canada, Middle East Airlines, National Car Rental and others to help personnel tap into their emotional intelligence to unlock increased job satisfaction and greater performance. Gailen is co-creator, executive producer and host of the nationally syndicated travel lifestyle show, The Jet Set; televised weekly in over 200 TV markets in the USA, Canada, and the Caribbean. 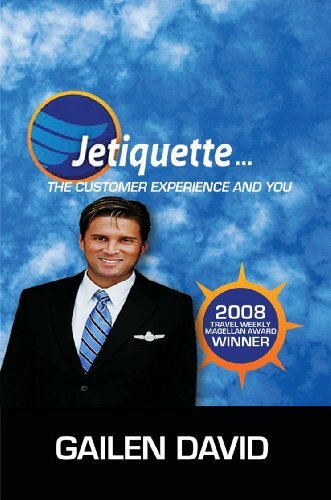 The "Jetiquette...The Customer Experience and You"
The Jetiquette Customer Experience Training Program has been recognized by Travel Weekly Magazine and presented with "The Magellan Award" in 2008. Gailen's from-the-heart program focused on showing front-line workers how valuable they really are and shared his own methods for recognizing and savoring the many rewards that come from making the travel experience special for someone else.